This picture of Eve depicts her as the holder and possessor of evil in the world. She is seemingly attempting to find comfort within the serpent, ignorantly knowing the pain and suffering it will bring. Eve is portrayed as very powerful in this picture. As the first person to sin, Eve must have struggled with pain and guilt. She damaged her relationship with God, Adam, and other species, subsequently affecting humanity for generations to come. However, she takes on this burden and carries the difficult responsibility, demonstrating her strength as a women. Instead of shedding only a negative light on Eve because of this action, there can also be a positive to account for. Because of Eve, humans are capable of a genuine and true relationship with the Lord and have the ability to choose morality and justice. Without her, all interactions with God would consist of false blind worship and skepticism. ​This image depicts the hierarchal relationship between Adam and Eve. The lighting in the painting shines upon Adam, displaying him as strong and powerful carrying fruit and offering it to his family. Eve is portrayed in her more submissive role as a child bearer, as God states: "in pain you shall bring forth children, yet your desire shall be for your husband, and he shall rule over you” (Genesis 3.16). 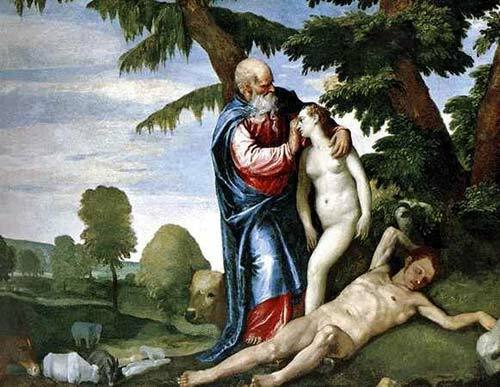 Both Eve and her children look up to Adam for guidance and survival, which shows how Eve was made from Adam to serve as a compliment and companion to serve her husband and fulfill his needs.